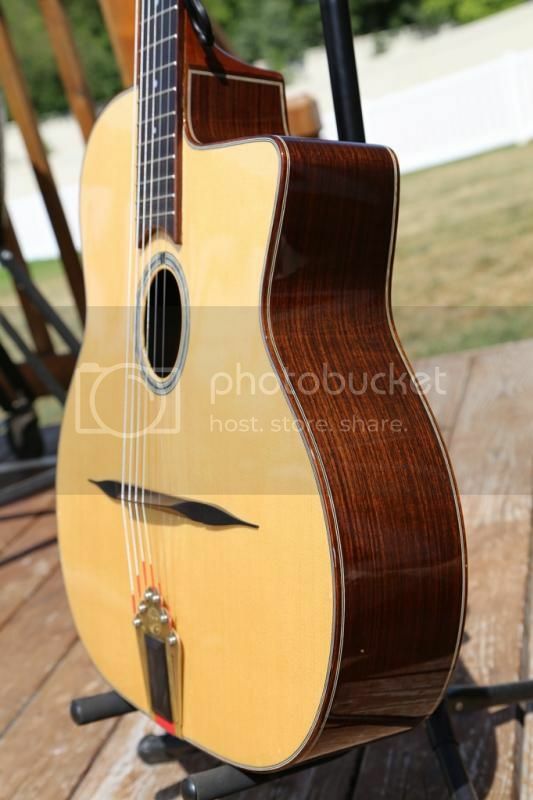 Dell'Arte gypsy jazz guitar - handmade USA model, solid woods - low price!!! 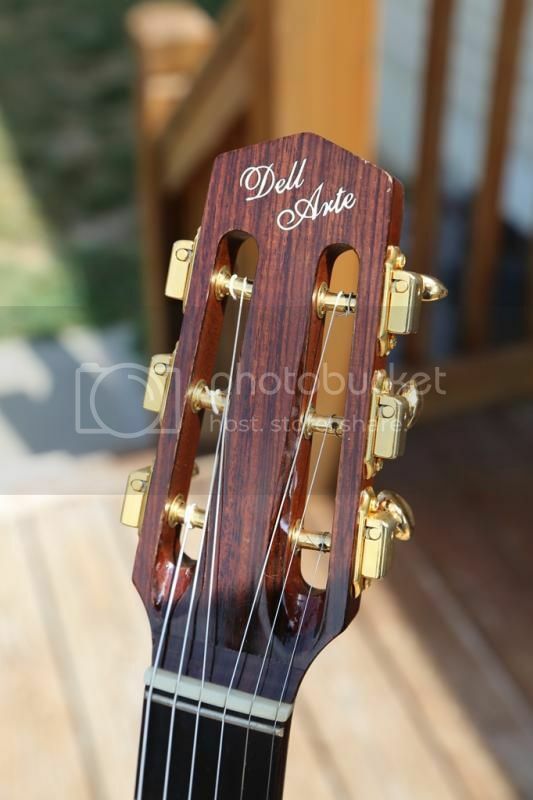 I am selling my Dell'Arte "Dark Eyes" gypsy jazz guitar. 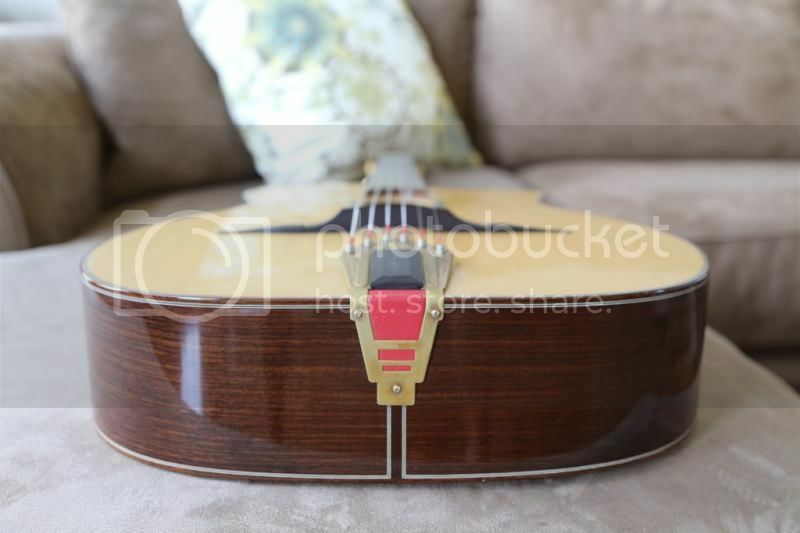 This is a wonderful chance to own a high quality, hand-crafted in the USA (by John Kinnard) gypsy jazz guitar for the price of an import guitar. 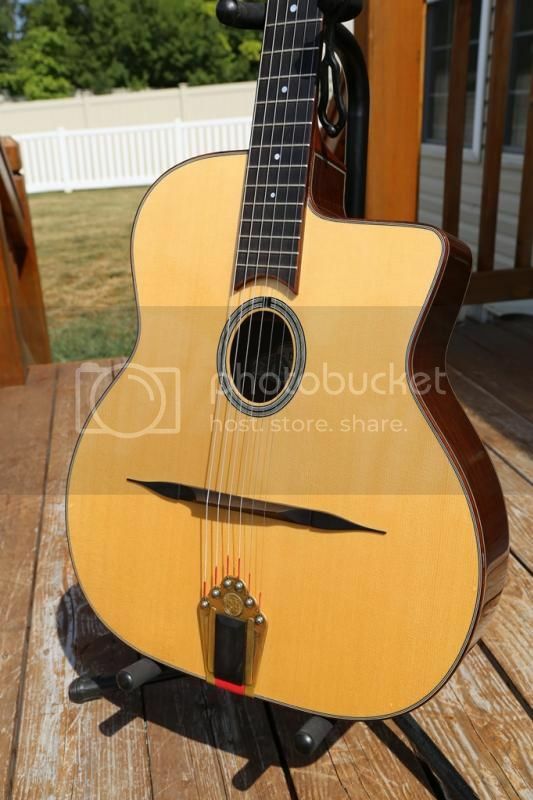 I bought this a few months back because I dabble in gypsy jazz (poorly! ) and have always been fascinated by these guitars. 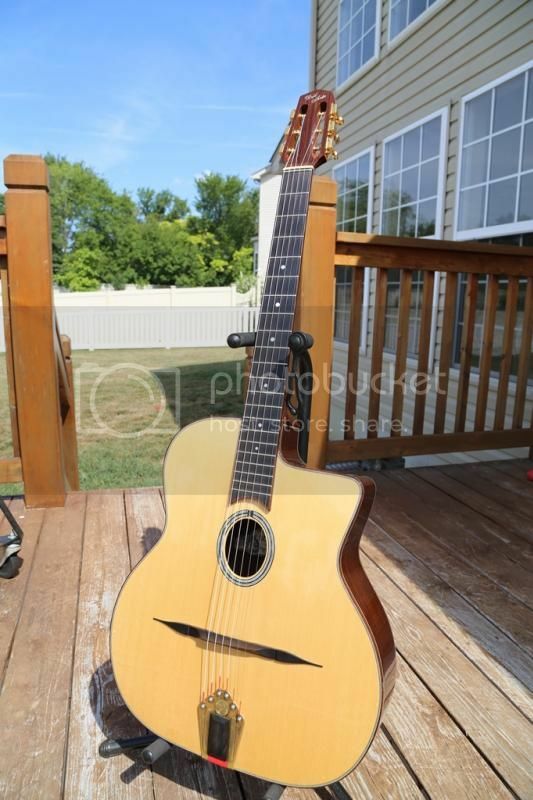 I've really enjoyed owning and playing this guitar, but I've found that a small body flat top steel string acoustic does a better job of fitting the multiple and various styles that I play with my band than the Selmer style does. 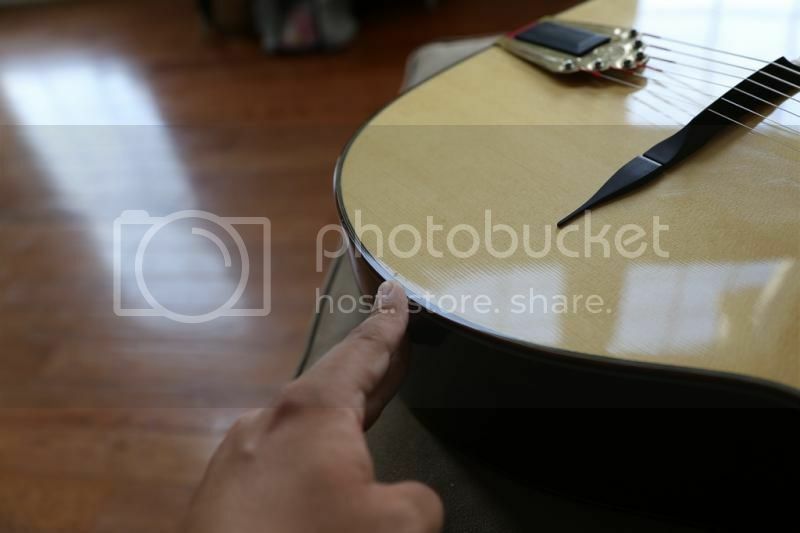 This guitar is NOT mint. It has been played and shows honest play wear. I will try to outline all of the various flaws, and have photographed what I believe to be the "worst". However, please note that all the flaws are only cosmetic. 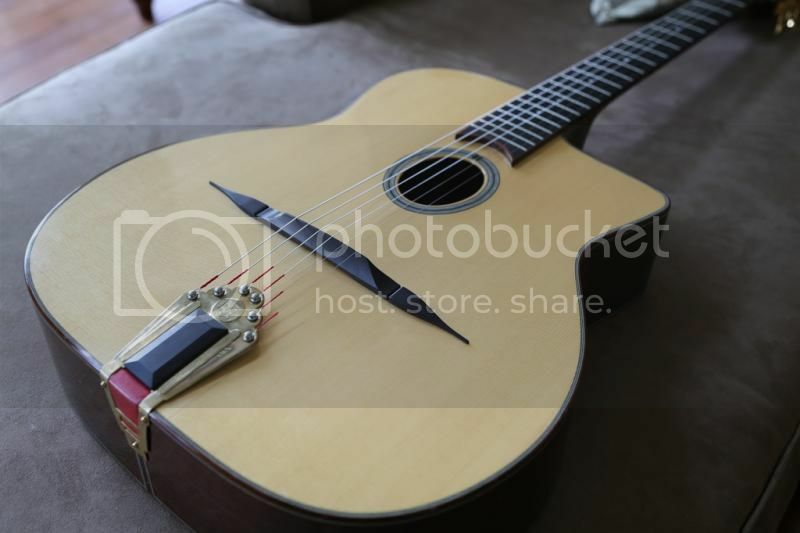 The guitar is structurally sound, plays very nicely with rather-low action of just under 2.5 mm (measured by sticking my 2.5 mm thick pick between the strings and fret at the 12th fret), and stays in tune very well. No issues what-so-ever, and it is ready to be played and played hard! The serial number is 500262. 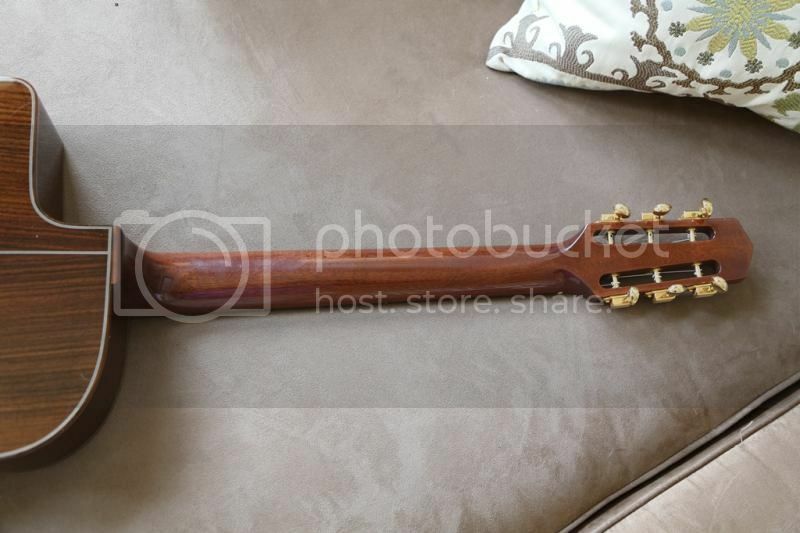 The guitar has a 670mm scale length and 1 13/16" nut width. 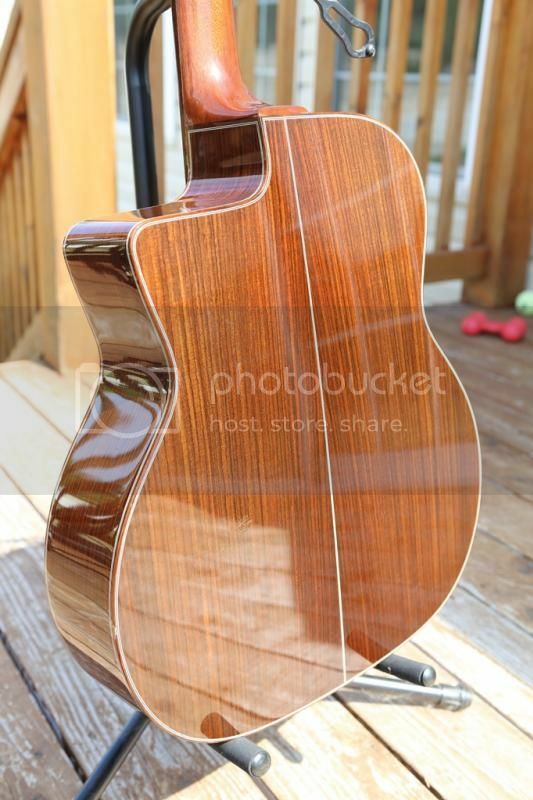 It has a gorgeous, silky, solid spruce top (the previous owner said it was European spruce, but I haven't confirmed that), and gorgeous, solid East Indian Rosewood back and sides. The woods truly are top notch! 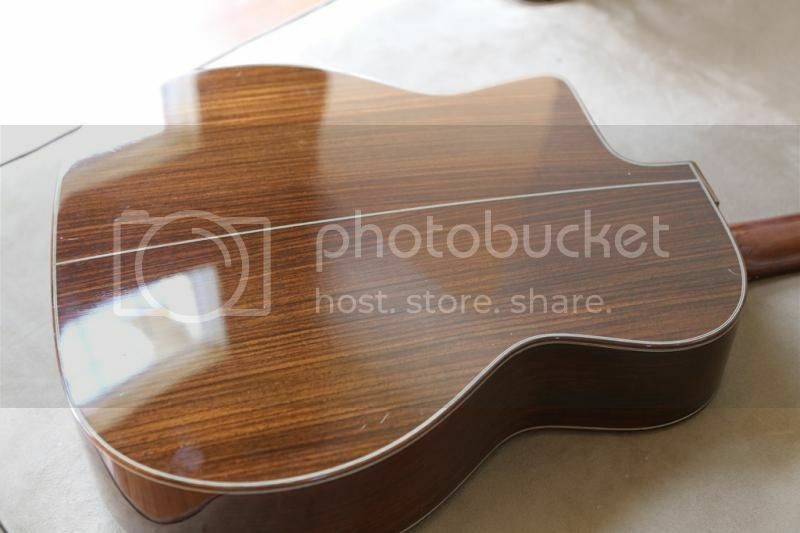 It has rosewood binding around the body and fretboard, and the fretboard and bridge appear to be ebony. 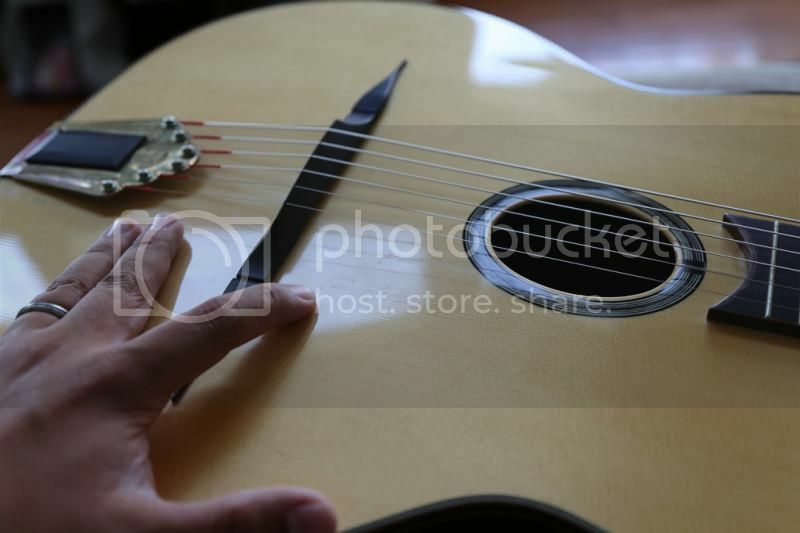 The guitar has four repaired top cracks. Only one is noticeable, and I have taken a picture of it. All four have been repaired and are stable. 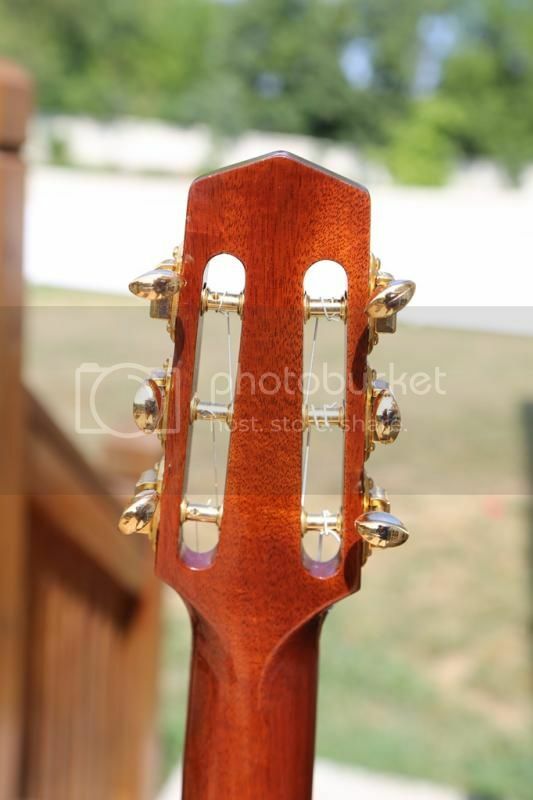 Three of the cracks are located by the tailpiece. 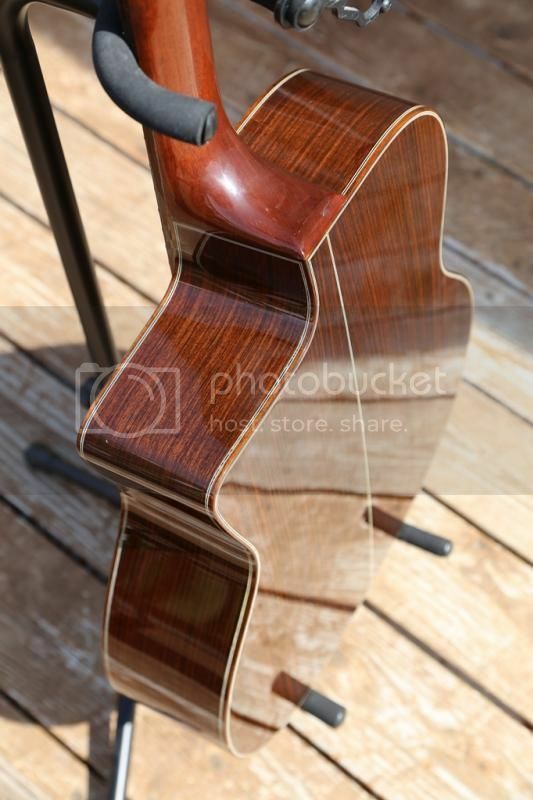 The one on the treble side of the tailpiece is the one that is somewhat noticeable. It is approximately 5" long. 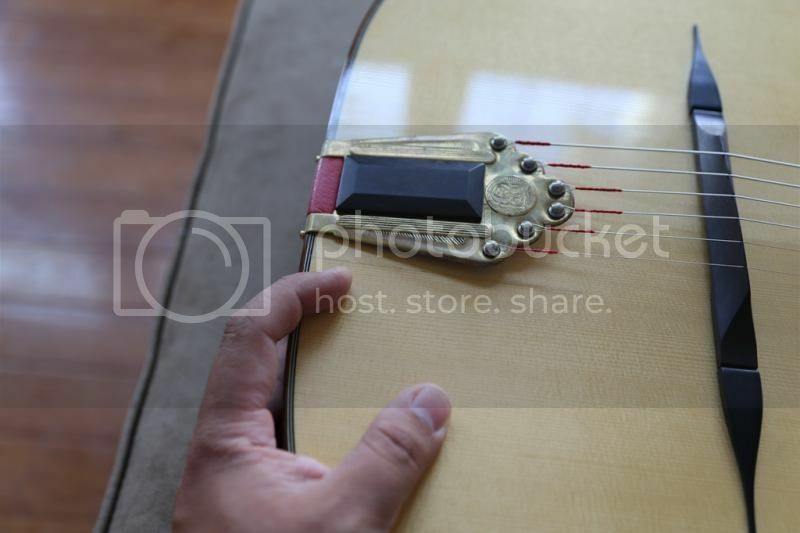 There is another one that appears to be a center seam separation just underneath the tailpiece. This one is a bit longer, running from the end of the guitar to within an inch of the bridge location. This one is much less noticeable, and I really had to look to see it. 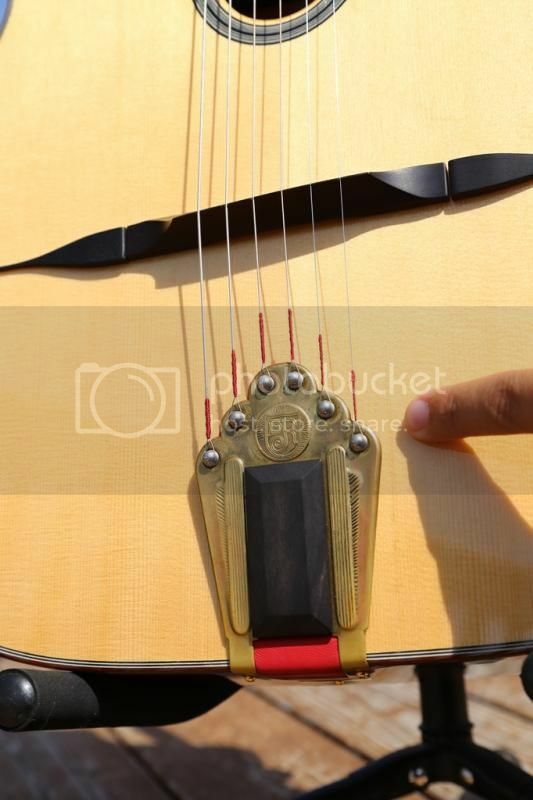 There is a third one on the bass side of the tailpiece, roughly 2.5 to 3 inches long. This one is much more difficult to see than the other two, and probably would not be noticed easily unless you knew about it. All three of these have been properly glued and cleated with diamond-shaped cleats. I confirmed this with a mirror myself, but am unable to get a photo of the cleats. 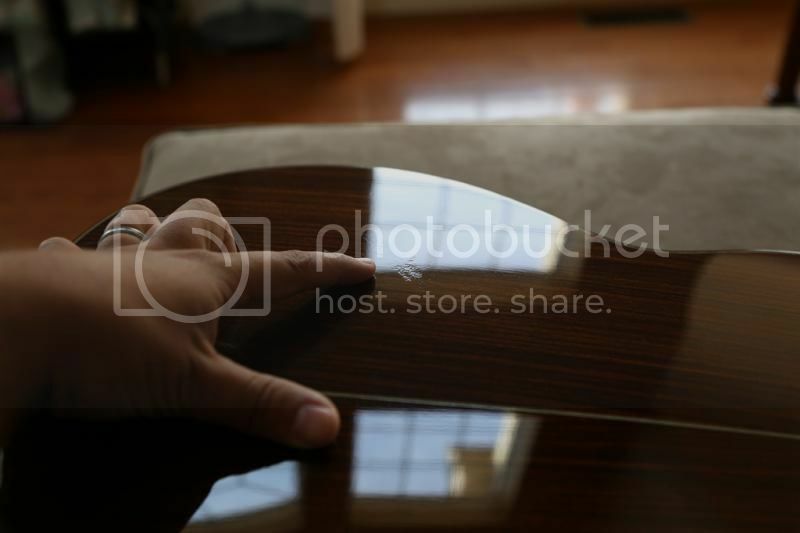 There is one last possible crack at the center seam between the fretboard and the sound hole. 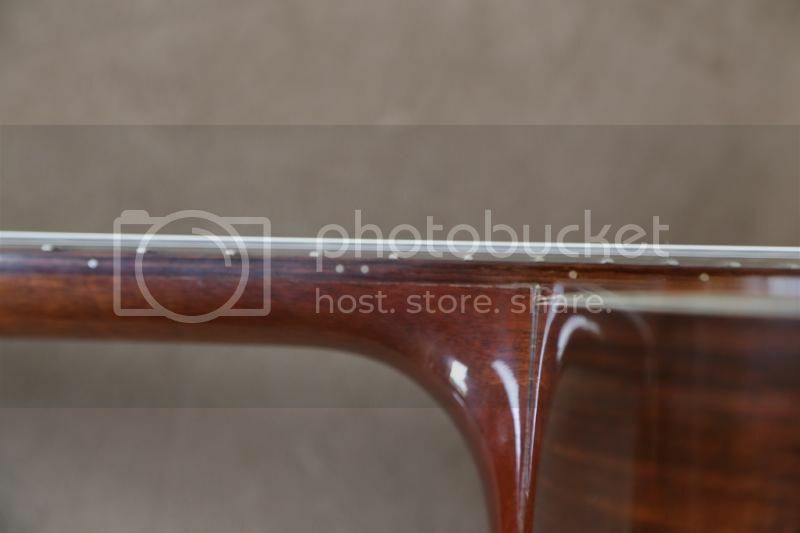 I say possible because the finish is clearly cracked, but I cannot confirm that the wood actually separated because there is a brace underneath the top in this location. The seam is tight and secure. 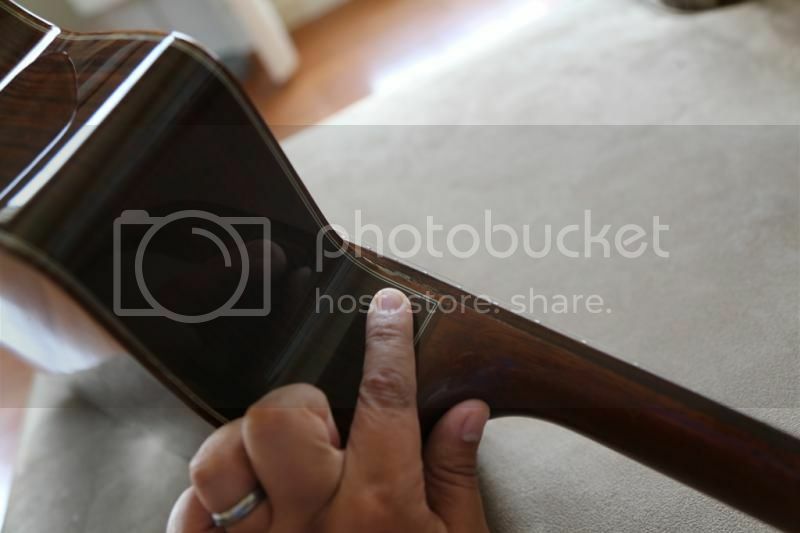 I believe that the guitar must have been subjected to low humidity at some point and was not properly humidified. 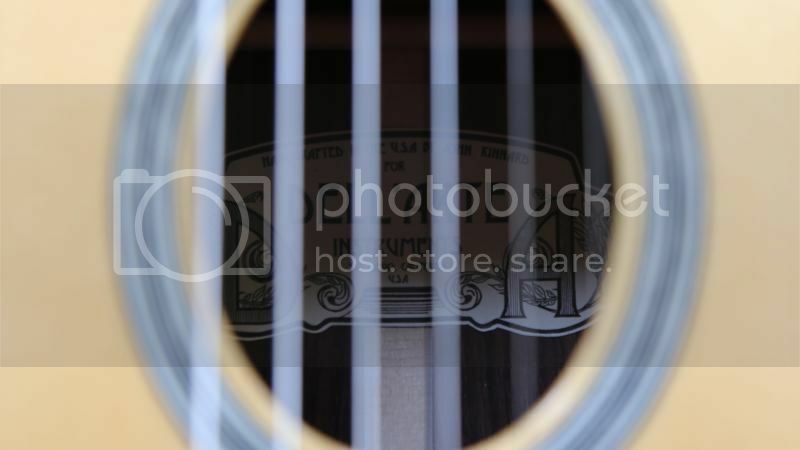 None of the cracks have moved or caused any issues while I have owned the guitar, and the guitar has been stored in its case and properly humidified at all times while I've owned it. 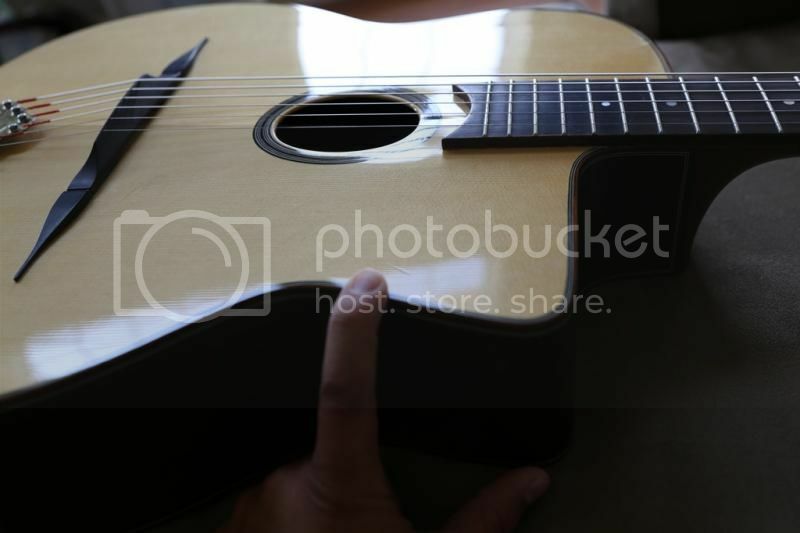 In addition, the guitar has multiple dings and a few scratches. I have photographed the worst of them, however, this does not account for all of them. 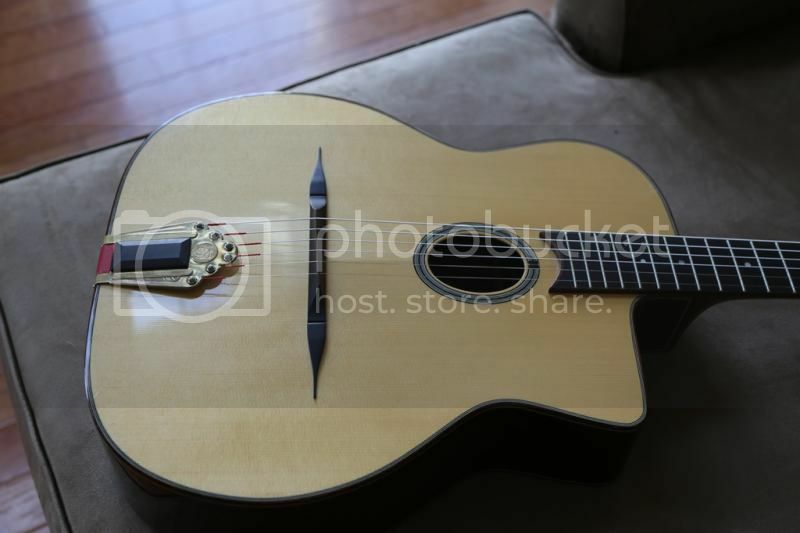 It also has some play wear in the usual strumming spot for gypsy jazz guitars. 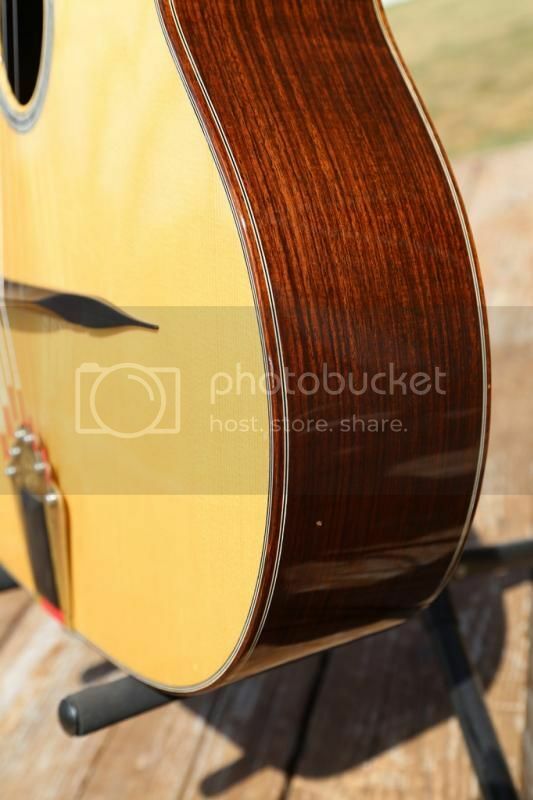 The guitar plays like a dream and sounds wonderful. 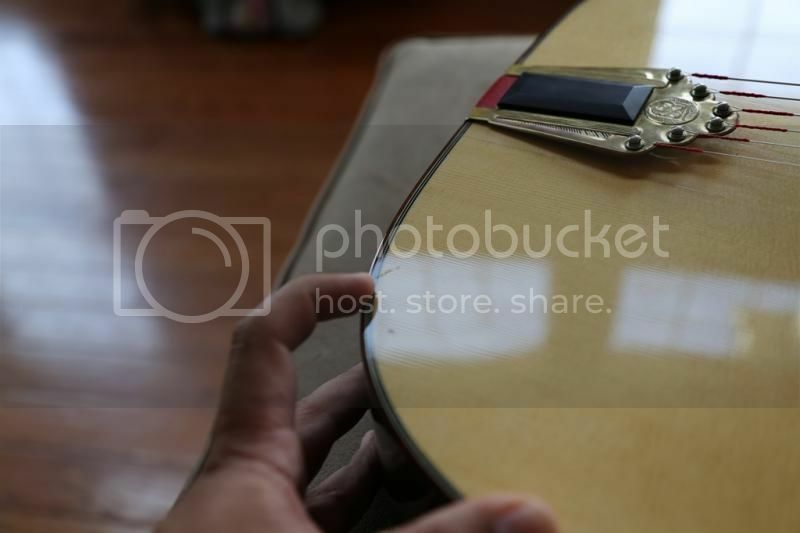 It does everything a Selmer style guitar should. It is significantly louder than, and projects much better than my Collings dreadnought. This guitar is LOUD!!! But it is also very responsive. 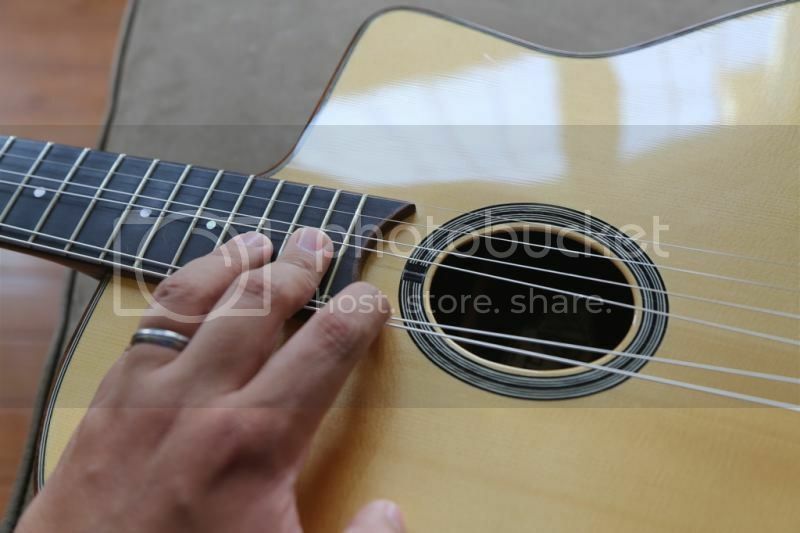 I was very impressed with how will this guitar works for fingerstyle. If you have ANY questions what-so-ever about the condition, please ask me. I am representing the guitar as honestly as I can. 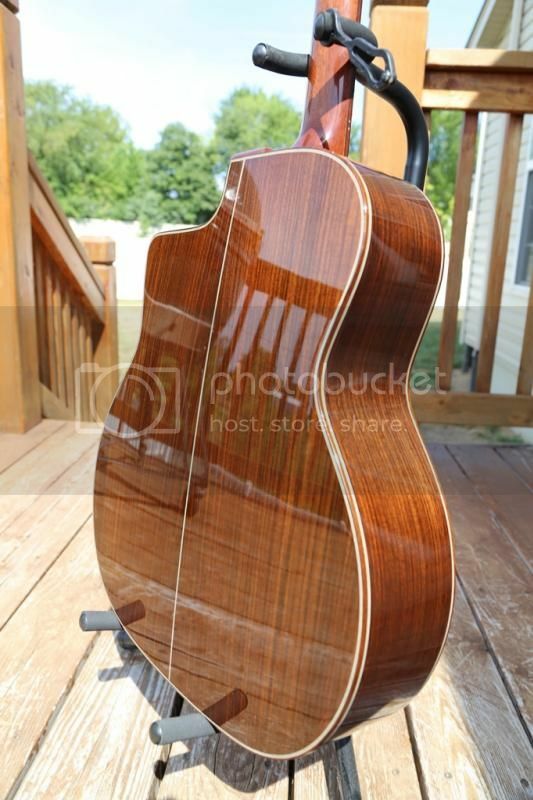 If you are OK with some properly repaired and completely stable cracks and honest play wear, I believe this is a great opportunity to own a wonderful guitar at a nice price. I was actually drawn in by the flaws - it may just be me, but I feel that gypsy jazz guitars just look RIGHT with some honest play wear! I'm located in Belleville, IL 62221, and am asking $1,100 shipped in the CONUS, but plus any PayPal fees if applicable. 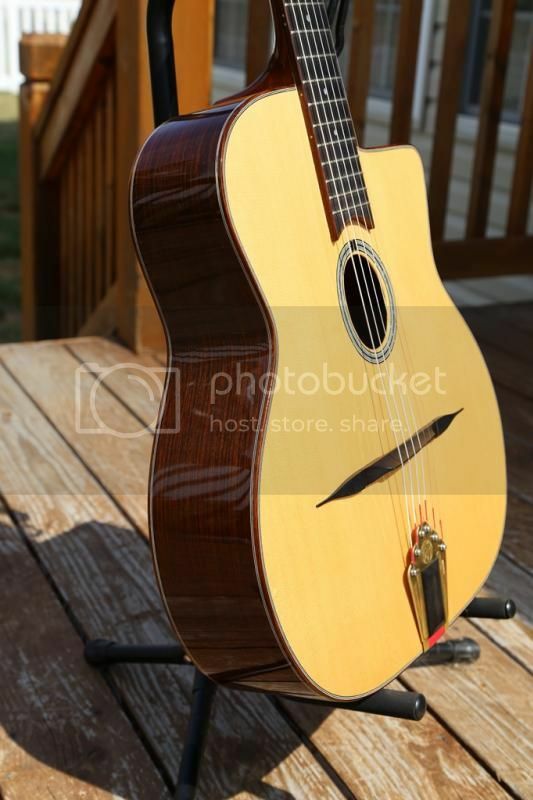 This is approximately the same going rate as some of Asian imports that I've seen out there, and you'll be getting a wonderful US made guitar hand crafted by John Kinnard. Please email me at bennyl118 at hotmail dot com with any questions. 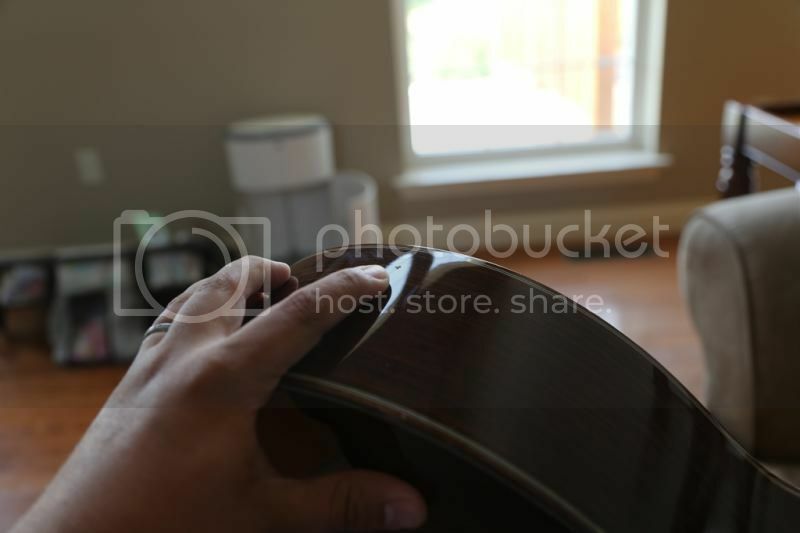 I am rarely on this forum, but I have plenty of references from good transactions on many other guitar forums if needed. 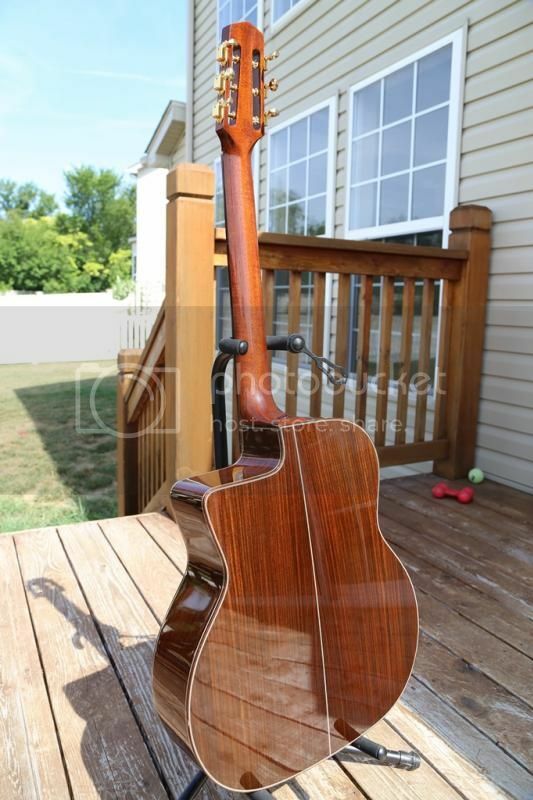 I'm not interested in trades because I have already purchased this guitar's replacement. Thanks for looking, and now on to lots of photos! Bump with a price drop to $1,000 shipped!